They looked like carnies moving in to set up a short-term carnival in the park across the street. Such groups traveled all over Mexico, providing villages and towns with a touch of excitement around the major holidays. The trucks were old and battered, the bus windows papered where the glass had broken and fallen away. I paid little attention. I was in a rush to enjoy my bath during the siesta, the mid-afternoon hours when Mexico and the entire Spanish-speaking world enjoyed a collective nap. By that time, the cold mountain water José drew in the horse trough early each morning had been warmed enough by the sun to make it perfect for a relaxing soak. I lifted the huge knocker on the double-paneled gate of solid mahogany marking the entry to my rented house and let it fall. Its thunder summoned José's wife at once. One of María's eyes appeared at the peephole before she yanked open the normal-size door carved through one of the portals. It made a less prepossessing, but more convenient, pedestrian entry than swinging open the huge panels of the gate itself. Once I stepped inside, she slammed the door behind me and leaned against it fanning her face with her hand. "Oh, señor," she whimpered, "those people moving into the park frighten me! I've closed and locked the shutters on the windows facing the street!" "Why?" I asked. "The windows all have bars on them. Not even a Chihuahua could slip through." Designed in the hacienda style, this house in central Mexico had comprised an impregnable fortress against attacks by armed bandits in an earlier era. For two centuries, until the early twentieth, El Mesón had served as an inn for donkey pack trains bearing supplies and trade goods to and from as far away as California. A "full house" at El Mesón looked as good to the bandidos as the gold bars at Fort Knox. "I know it sounds silly," conceded María, "but these people really do work magic! They change themselves into cats, THEN slip through the bars." "Why would they want to sneak in here?" Hardly able to cope with my ignorance, María threw up her hands. "The hex, señor, the evil eye! That is what they do. They lay curses on you if they don't like you, and now I am sure they hate me!" I shook my head. "Why would they dislike you? Everybody in town likes you and José. You churn butter for the nuns, and your husband provides fresh vegetables to the Jesuits who run the boys' school. The Church is certainly on your side." She tossed her head and harrumphed. "The Church! Even the sisters and the fathers have no power against pagans like these. My mother told me she once saw a baby they cursed in the womb. The priest prayed, even said a Mass, but the child was crippled for life. They have a devil boy themselves! He came to the door this afternoon and knocked. How could he do that? He has no arms or legs! How could he reach the knocker? He had to fly up there! He MUST be a devil! I was mopping at the time. When I opened the door and saw him, I was so frightened I threw the mop bucket at him and slammed the door. I've had a splitting headache ever since. He put a hex on me!" It was clear she had worked herself into a state. Still, I did not quite understand. "Who are these people?" I asked. "They looked like simple carnies to me." "Oh, no, señor," she cried, crossing herself, "they are Gypsies! They steal everything in sight. Even babies, it is said. No child will be safe in the whole town, and it's Christmas time! What are we to do?" Gypsies! Of course! The hex, the magic, the predatory nature, the evil eye--I should have guessed. Gypsies were demonized wherever they roamed. Unable to answer her rhetorical question as to what to do, I retired to the corral, climbed into the wide concrete trough, which was long enough to water six thirsty horses at a time, and luxuriated in my bath. The only running water in this crumbling hacienda of twenty-six rooms (just eight of which were in use) flowed from a mountain stream through the faucet suspended near my toes. I rented El Mesón for sixteen dollars a month from an eccentric French artist who lived in a partially restored palace in the suburbs of Guadalajara, four hours away by bus. I loved it. Behind the corral, in the stalls of which we often sheltered the neighborhood horses, lay an acre of garden and orchard surrounded by fifteen-foot brick walls. José grew a variety of fresh produce which he donated to our table and to the Jesuits who ran the exclusive boys' school in our little town. Beneath the mild sun of that balmy midwinter afternoon, I contemplated this splendid opportunity to make the acquaintance of the first Romany people I had encountered in Latin America. I had known some Gypsies in Cincinnati, rural Italy and Spain. A wanderer myself, their peripatetic life style fascinated me no end. After my bath, I dressed and went out to take a look. No sooner had I stepped beyond the door than I saw the "devil" boy described by María. Although nothing in his demeanor suggested menace, the sight of him did give me pause. She had been right in saying he had neither arms nor legs in the normal sense, but he did have strong upper arms extending nearly to the elbow and thighs ending halfway to the knees. It was almost impossible, however, to imagine how he could have reached the high knocker to bring María to the door. His face suggested his age to be about twelve. He was laughing with a tall, lean woman in her late middle years. Wearing sandals, she was dressed in classically Gypsy style--red satin skirt, spangled blouse, pounds of gold-colored jewelry and a pink scarf, called a rebozo, covering most of her dark, curling hair. He was at her feet, his head turned upward like a flower to the sun. The contrast between them was notable. His skin embodied the rich color of molasses, with a prominent nose rising beneath enormous black eyes set in a broad, handsome face full of sparkling white teeth. It was a face one sometimes saw on the pottery figures of ancient Mexico, whereas her sharper features had the delicacy of a Dresden doll modeled in India. Her mysterious, kohl-rimmed eyes were deeply set like jewels in a honey-colored complexion. He noticed my staring at them from across the street. He waved one of his stumps and grinned. "Hello, señor," he called in Spanish, "you look like you don't belong here! Yo tampoco! Me neither!" Delighted to find him not just friendly, but a wit, I went over and introduced myself. "¡Tienes razón! You're right," I said. "I rented El Mesón for the winter. We're both foreigners in this town, I guess--a Gypsy and a pinchi gringo!" He tapped his arm stumps together and chortled with glee, tickled by my use of pinchi gringo, which translated as "damn Yankee." The term also applied to a highly venomous white scorpion whose poison matched the contempt shamelessly expressed by norteamericanos for Mexicans. "I am Paco," the boy said, "and this is my mother, our queen." The Gypsy woman gave me an appraising glance. They invited me to the center of the circle formed by their vehicles, where an open fire burned. The queen poured strong, hot coffee into tin cups and offered me a freshly deep-fried churro, a sort of cruller often served at Mexican fairs. I noticed when we left the sidewalk that Paco propelled himself forward on a low cart by pushing on the ground with his calloused arm stumps. It was painful to watch how he had to fold himself nearly double. Only the suppleness of youth and a lifetime of practice could have enabled him to do it without fracturing his ribs or his spine. I saw several of the Gypsies munching on corn tortillas and digging into skillets full of refried beans, as any self-respecting Mexican might do. One open-backed truck revealed a living space furnished with arm chairs, a cot and a large portrait of the Virgin of Guadalupe, patron saint of Mexico. María had been wrong in her estimation of the Gypsies as pagans. They appeared to be devoutly Catholic, as far I could see. The queen crossed herself as we passed the shrine. I could sense they were not used to socializing with foreigners. I suspected they were more used to the sort of treatment accorded Paco by María. I apologized for María's bad behavior, wondering whether or not to mention her fear of him and his people. He took care of that for me when he said: "She couldn't help it. The people in the mountains do much worse to me. I can't blame them. Most of them are frightened at first. I'm an unusual person. Not everybody looks like me." He chuckled, although not bitterly. "But please don't blame your housekeeper. It was my fault. I went to ask her for a bucket of water because the only faucet in the park was pouring out mud. I can hang a bucket on one shoulder, you see. I went over there and couldn't reach the knocker, so I said to a nun passing by, 'Reverend Mother, would you lend me a hand?' I thought that was funny. So did she. After laughing, she used the knocker and went on her way. Then came your María. I got the bucket of water, I did! In my face!" He laughed uproariously. "She was afraid of me. Of course, I forgave her in my heart. It is not healthy to hold a grudge." I thought how ashamed María should feel if she heard he had placed a blessing on her, not a curse. I had been right to think her headache was of her own making, not his. "That is right, my son," his mother said, leaning down to stroke his cheek. "Go on now. You have chores to do. The villagers will be coming when we hang the bright lights. We must be ready. I'll have many fortunes to tell." We watched him trundle off humming a bright tune. The queen's eyes followed him lovingly before turning back to me. "I should tell you that my name is Concepción. Everyone in my tribe is Mexican-born although the grandparents of our families came from Spain. Paco is not truly my son. I have seen by the way you look at us that you perceive the difference. It is surprising how many people do not. I found him," she went on, "abandoned on a mountainside shortly after his birth. He probably was born into a large family of simple Indian people who could not feed another mouth in a home where all must work, where there was no room for a caprice of nature who could make no contribution as they would understand it. I could not help but love him. My husband, our king, whose heart gave out two years ago, adored him, too. We have been good for Paco. We understand. With us, he is not a freak. In this culture, we are misfits, too. People think Gypsies steal babies and sell them. They would probably accuse me of 'stealing' this child, if they knew." "Only people like me would notice it, Doña Concepción," I said. "Most have trouble seeing beyond the ends of their own noses. A friend of mine likes to say that most people are dead from the neck up. I sometimes agree." She gestured toward two young men setting up a screen on the rear platform of a truck. "We are in the movie business. We travel from village to village showing old movies. They have no entertainment in the mountains except for a few noisy cantinas where the farmers drink beer and tequila on Saturday nights. We don't charge much, but everyone comes from miles around. We do pretty well because of the volume. Let me say we survive. We carry our own generators to run the projectors. When the projectors break down, which they often do, I read palms among the crowd." I returned to them that evening, with José, after they set up and turned on their electric banner: Movies! Your Future Told! Crossing over, I looked back and sensed María's eye at the peephole. I knew she was twisting her rosary in her hands. Naturally, she had refused to come. I had not tried to force it. I believed such things had a way of taking care of themselves. There was quite a crowd. José disappeared into it. Everyone enjoyed the movie, a ragged old print sputtering along out of synch with its sound, but it could have been a first-run in New York from the way the audience cheered the cowboys, booed the bandidos and sang along with the rousing musical numbers. Gypsies moved among them selling churros, as well as coffee and soda pop. The queen sat at a table near the sidewalk, offering the option of "Your Future Told!" to those who dared. In cowboy boots, bluejeans, ranch shirt and straw sombrero-- my standard mode of dress for village life-- I sat behind her with Paco at my side, on exhibition for my high commercial appeal. "Ha, you will attract them like flies," Doña Concepción had laughed. "The pinchi gringo and the Gypsies! I concede top billing to you!" I observed that the local ladies kept a good grip on their purses, and the townsmen, looking silly, clutched the wallet pockets on their backsides. Paco pointed out a young couple who stood waiting in line. "Look at those two!" he whispered. "He doesn't know which he loves most. He's got one hand on his money, and the other on her behind!" It broke me up. "We don't steal," he told me proudly later. "My mother says it's wrong and not a Christian thing to do. We're in the movie business. That's legit. Pickpocketing isn't." When time came to turn the banner off, the jingle of coins representing the take for the night resounded from the counting truck. "People are more generous with themselves at Christmas time," the queen said. "I think every adult and young girl who came to see the movie tonight also had their fortune told. This was a grand day. Thank goodness! Tomorrow they all will be at the family parties of Christmas Eve. We have never been invited to a posada, nor ever shall. No one thinks of the 'pagan' gypsy on a Christian holiday." There was poignancy in her tone, but, as with Paco earlier in the day, no bitterness, just an acceptance of her lot in life. She turned then to me. "Yes, business was good tonight, but what's more important, Paco and I have made a new friend. May I see your palms, please? We have seen much already in your eyes and have felt much from your heart. The rest will be revealed in your hands." I sat opposite her at the table and stuck my hands out with the palms facing up. Without touching me, she studied them for awhile. Finally, she said: "You have a lot of character, not all of it good, and your destiny is to achieve fulfillment at the end of a long life, but not before. You will do nicely as a friend." Paco, sitting at my knee, lifted his arms to the edge of the table. "Read these, Mamacita." Unruffled, she touched each stump in turn. "Your character is without flaw, my angel. You're a good son." Before I went to bed that night, I opened the shutters of my floor-to-ceiling window to look out at the moonlit cobblestones of the street. There were no glass panes in that climate, just iron bars to keep the bandidos out. Change yourselves into cats, my Gypsy friends, I thought, and come on in. 'Mi casa es tu casa.' My house is your house. The next morning, María called me to breakfast with an accusing look on her face. "My husband came home before you did," she said. "José told me you were sitting with the Gypsy queen and the devil child the whole time." For the moment, I held my tongue. She stopped pouring my coffee and held the pot in midair. "I hope they haven't cast a spell on you to get even with me." "Funny you should mention that," I said. "They've cast a spell on me, for sure. We're giving a posada for them tonight. Here, in El Mesón. They have never been invited to one before." Her breath came in a gasp. She set the pot on the table and sat down with a thud. I gave her a moment to collect herself before adding: "Don't worry. You won't have to make the tamales. I talked to Sister Anna when she walked past my window this morning on her way to the convent with the masa dough to make tortillas for the nuns. She told me they have an overabundance of tamales made for them by grateful people for the holidays. She wants us to have as many as we need. She feels she owes us for the butter you churn." María looked even more aghast than before. "That is an act of Christian charity! They owe me nothing!" I chuckled. "You're right. They don't owe you. But because I pay for the cream you use to make the butter and because I am neither Catholic nor particularly Christian, they owe ME." I rose to leave the table. "Oh, yes, I know that you secretly sell the leftover buttermilk to the neighbors. I don't mind, María, but in exchange for my allowing you to do that, I would appreciate your making the atole to drink with the tamales. Today, when I walk the dogs to the market, I will buy the cajeta to flavor it with. It's Christmas Eve. Please help to make this posada wonderful for my new friends." Leaving poor María in a minor state of shock, I strolled to the Gypsy camp around noon to invite them to the posada. There were about twenty in the tribe, comprising four families of adults and one girl in her late teens, plus Paco and the Gypsy queen. This time, I took my brace of dachshunds along. I walked them on a double lead, side by side, the most convenient way to handle them both at the same time. Muscular and strong, they pulled me at a trot. The exercise was good for us. I had to jog. Paco was the first to see us coming, sitting on his rolling platform on the ground near his truck. Obviously, he had never seen dogs like mine. His eyes popped. His mouth gaped. He gurgled sounds of surprise and delight. "Those can't be dogs," he marveled. "They must be chorizos! Sausages!" I gripped them tightly by the lead, wary of their deceptively small but powerful jaws as they approached him. The male was unpredictable. Paco sat perfectly still. Given his small size, the lack of arms for fighting back and the lack of legs for running, it was reasonable that he would be cautious on first meeting a dog, especially if the dog were large, or if there were two. They sniffed him, then sniffed again. I heard the female sigh. She liked Paco. She pawed at him gently. She wanted to give him a kiss. The male, conveying his judgment of "I guess this twerp is no threat," lay down and rested his nose between his paws, completely at ease. Paco was a hit. 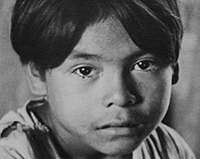 He and his mother were thrilled by my invitation to El Mesón and accepted at once for the whole tribe. "How wonderful that someone wants to entertain US!" cried Doña Concepción. "Yes, we will be delighted to come. Imagine! A real posada! For us!" Paco got along famously with the dogs. Maneuvering, with my help, the large loop of their lead over his head until it dropped past his shoulders for a firm grip around his small chest, he prodded them into pulling him on his little cart around the camp. I smiled. It seemed so apt on Christmas Eve, and he was a child who had never heard of Santa Claus and the reindeer sleigh! Here, as in Italy and Spain, gifts were brought by the Magi, the Three Kings, usually on the eve of Epiphany, called Twelfth Night. Epiphany, also known as Little Christmas, commemorated the baptism of Jesus and the visit of the Three Wise Men to Bethlehem. Epiphany itself was actually the Twelfth Day after Christmas, January sixth. I couldn't resist walking with him and his reindeer dogs to the center of town. They created a sensation in the marketplace. Paco relished his success with the panache of a star. At the stall where I bought a piñata, the proprietor, a chubby woman, sang out Christmas greetings in a lilting Mexican carol. In a boyish soprano voice of good timbre and pitch, Paco joined her in singing until a crowd gathered, and they sang another. I stood aside with the piñata, a brightly decorated clay form for posadas and birthday parties. Hung overhead, it would split open when struck with a stick, raining candy and party favors over anyone below. My choice of a piñata took the shape of a comical burro the size of Paco himself, which I considered appropriate to El Mesón where countless donkeys had stopped overnight for two hundred years. When we started off again, I slung it over my shoulder, looping the hanging cord on my fingers. After awhile, the string began to cut me. I stopped to readjust. The dogs pulled Paco on ahead. I noticed then that a large, black dog appeared to be stalking them on the other side of the market stalls. I didn't like the look of him. I stopped next to buy a jar of cajeta, a caramel concoction made of sugar boiled with milk, ubiquitous in Latin America. Unkempt and scrawny, with a mean glimmer in his eye, the black dog continued to pace himself corresponding to the movements of Paco and the dachshunds, slowing down and speeding up as they made their way through the crowd. As we turned down our street, the crowd thinned. Nearing El Mesón and the Gypsy camp, I had a strange feeling and looked back. The stray dog stood in the middle of the road, head lowered as if sizing me up. I stopped and started toward him. He stiffened and growled. I stamped my foot and growled back. Typically of a bully, he turned tail and ran. I was glad to see him go. Having got the boy safely back to his mother, I went home to make final preparations. During the remainder of the afternoon, José, María and I transformed the largest covered stall in the corral into a facsimile of the stable where Jesus was born. Although María was at first somewhat uncooperative because of her continuing fear of the Gypsies, she relented when I told her my favorite Jesuit would be there, as would the two convent nuns who were bringing the tamales. For them, she was willing to put on a show. To my surprise, she produced the key to a storeroom of which I knew nothing. From it, she and her husband carried magnificently carved wooden figures representing the characters of the Christmas crèche which had been set up annually for the enjoyment of travelers during the years El Mesón had been an inn. They were priceless. I began to have a fresh appreciation for my French landlord's taste in art. They were lifesize. Mary was depicted kneeling over the cradle with Joseph standing at her side. The baby Jesus was exquisite. We placed Him in the cradle on a bed of fresh straw. There were also a shepherd and two lambs. When the Gypsies came to the door, it was already dark. We swung open the wide gates to greet them with lanterns in our hands--the nuns, the Jesuit, José and me. Not María. She was out back standing guard at the crèche, muttering, "Those pagans will never get their hands on these!" What an evening we had! The Jesuit, a Spaniard who often accompanied me when I walked my dogs in the hills above town, told us stories about his early life as the youngest son in a wealthy family of horse breeders near Seville. He taught history at the boys' school in our village square. The nuns were educators, too, and found themselves fascinated by the Gypsy queen. They insisted she read their palms. She was horrified. "Holy Sisters," she cried, "that would be sacrilege! You are married to our Lord!" "But we are still in the world," responded one with a gentle smile, "and must deal with it every day." "Yes, dear," said the other, a maternal type, "we, too, have a human life." Doña Concepción finally agreed. Everyone gathered round. "You were meant to be an actress!" she said to the first as she read her palm. The nun caught her breath. "Oh, you are good, señora! That's what I always wanted to be! Why, even now, I direct all the school plays!" José had strung a line across the cobble stoned, 80-foot-square central courtyard and hung it with kerosene lanterns. The soft glow illuminated María's velvety red and white poinsettias at the base of the palm tree in the center. This was the spot chosen by the two Gypsy men who brought guitars. They sang lovely melodies in the Romany tongue. The Gypsy queen, in a simple black gown, with her hair hanging halfway down her back, danced a sultry flamenco to soft chanting by the Gypsy men. 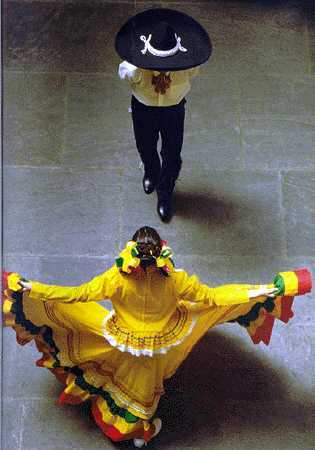 The teenage girl of the tribe and her handsome fiancé whirled through the Jarabe Tapatío, the traditional Mexican Hat Dance based on courtship, in which the woman first rejects and then accepts her beau. María had long since left her post guarding the crèche--which our guests had not seen because it was out back in the corral--to serve the atole. This drink of hot milk thickened with maize flour was a tradition at posadas. María's was especially good, flavored with cajeta. She softened a bit toward the Gypsies when they praised its wonderful taste. She did make a point, however, of avoiding Paco, whether from unreasoning fear of him or from shame for dousing him at the door, I was not sure. She was a superstitious person, but she was not spiteful or beyond the reach of love. I had faith she would come around. When it came time to conduct the ritual which marked the gathering as a posada. I unobtrusively singled out certain of the guests, who made their way discreetly to the corral. A few minutes later, I called for silence and asked everyone to look toward the back of the courtyard to the arch dividing it from the corral. Suspended from it was a lantern illuminating a paper star. Below, holding a candle, María sat astride a burro borrowed from a neighbor. Wearing a rebozo over her hair, she symbolized the Virgin Mary. 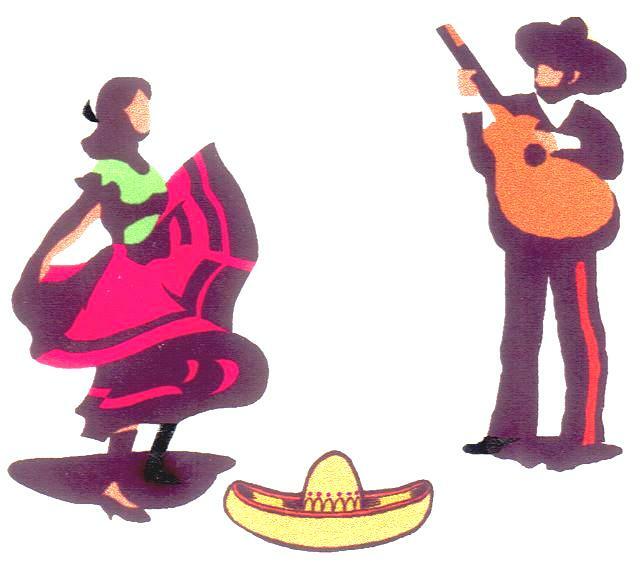 As Joseph, José, in the white cotton clothing and straw sombrero of a Mexican peon, stood beside her. While I led the tribe of Gypsies toward the arch, the Jesuit, standing to the side, sang in a rich baritone the traditional Mexican carol which gave the posada its name. It began, En nombre del cielo, os pido posada....."In the name of heaven, I ask for lodging (posada).....," as if it were sung by Joseph to the innkeeper, and continued, "for my beloved wife cannot go on." It ended after several verses, when one of the nuns stepped out of the corral with a sweeping gesture as if opening the doors and sang in a light contralto the second traditional hymn which invited them to enter the stable as there was no room inside the inn. Both were accompanied on a flute by the second nun. Stepping into the corral gave us a good view of the crèche. A dozen lanterns arranged as footlights illumined it like a theatrical tableau. Now came the surprise I had planned especially for María in an effort to show her Paco as he really was. There was a third and final hymn of the posada which Paco had never heard, so I let him choose something he knew. He sat on his cart in the crèche beside the cradle. To the haunting music of the flute, he lifted his voice to sing an old carol in praise of Niño Jesús, "Baby Jesus." His uplifted face shone brighter than the lanterns of the tableau. Having positioned myself next to the donkey, I heard María begin to sob halfway through Paco's performance. The burro was such a small animal and she so short that I was able to place an arm about her shoulders and give her a comforting squeeze. I knew she had come to her senses about Paco at last. That cascade of tears could only mean heartfelt contrition. "Please, Father," the boy addressed the Jesuit when his song ended, "will you tell us about Baby Jesus?" The priest smiled and stepped forward. "Well, God sent his angels to announce that our Savior was born, and, I think, dear Paco, they must have looked like you....."
The words gave wings to that pathetically crippled boy. He could have flown away. After the biblical story was told, we returned to the usable part of the house where the burro piñata hung from a beam. In the absence of any children but Paco, the engaged Gypsy couple were given the honor of breaking it. Blindfolded, they pranced about swinging sticks to waves of cries that guided them hot and cold, hot and cold, until the girl's stick burst it open and the candies and favors showered down on Paco, who sat below. María, finally overcoming her embarrassment, cornered him just as everyone was ready to leave. She apologized from the depths of her soul and told him, "God sent you to twist this crooked woman straight. Truly, you must be an angel! You even flew up to knock on the gate!" Paco grinned and revealed the story of the passing nun who had "lent" him a hand. With María on her knees beside him at the open gate, they dissolved in laughter at the joke. "Señora, I'm no angel," he said when they fully regained their composure, "I will never be anything but what you see. This is the way God made me." The others had gone on their way while those two lingered at the gate. María massaged the stumps of his arms. "This is what you need, and I shall do it every day while you are near us here," she promised before she let him go. Together, José and I pulled the huge gate shut. No sooner had we done so than we heard agonized screams from the street. Barking frantically, the dachshunds rushed to my side, desperate to get out. I opened the pedestrian door. They leapt over one another rushing into the moonlit night. I followed in time to see them chasing the black dog that had followed us from the market. Obviously, the monstrous creature had returned to wait for an opportunity to attack Paco. The chance came when we allowed our boy to leave alone. In deathly silence, Paco lay crumpled at my feet in a widening pool of blood.